Mannin Music can tailor training days and events to suit your staff development needs. Our musical training can help your business by promoting teamwork, encouraging listening and communication skills, improving performance and presentation skills, building confidence, and fostering a sense of community. A huge movement now across the world has been Choirs in Offices. Mannin Music can organise a weekly choir session to fit in with your office schedule. We can also run choir and conducting sessions as part of an in-house training day, or offer a fully managed choral training day set in a working theatre. Singing releases endorphins and oxytocin, which supports good mental health, and reduces stress and anxiety levels. 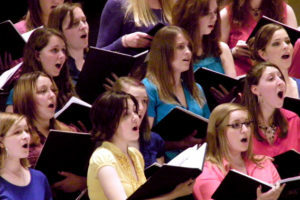 Singing is an aerobic activity, which helps to strengthen your heart and lungs. Singing increases the amount of immunoglobin A, which boosts your immune system. Mannin Music works with a wide range of qualified and experienced instrumental teachers. We offer individual or group lessons in your work place at lunchtimes, after work, or at a time to suit your needs. We currently offer: voice, violin, cello, double bass, flute, whistle, all brass instruments, acoustic and electric guitar, electric bass, and drums. Instruments are available to hire. Mannin Music also holds the franchise for The Rock Project (www.therockproject.com) on the Isle of Man. The Rock Project is the biggest school of rock and pop for 7-18 year olds in the British Isles, and we are excited to be able to trial this fantastic project in offices. As part of a Rock Project session your employees would receive small group instrumental tuition on their chosen instrument, and then be taught the skills needed to work together in a band. All instruments and equipment are provided.